Product #55693 | SKU AX4U266638G16-DT41 | 0.0 (no ratings yet) Thanks for your rating! Brings together outstanding performance and mesmerising RGB lighting to give you a worthy upgrade for your system. 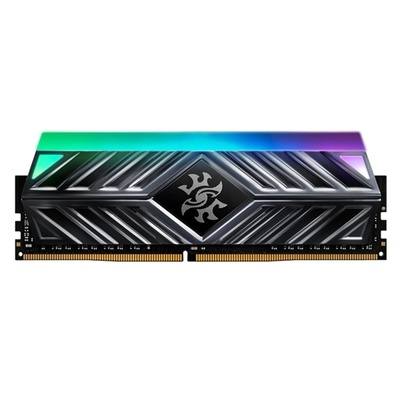 The ADATA XPG SPECTRIX D41 16GB DDR4 2666MHz RGB LED RAM Module (Grey, 2 x 8GB) brings together outstanding performance and mesmerizing RGB lighting to give you a worthy upgrade for your system. Featuring stunning speeds up to 5000MHz the SPECTRIX D41 delivers smooth, fast gaming and overclocking, all the while supporting Intel® X299 and AMD AM4/Ryzen platforms. What’s more, with vivid RGB lighting that is compatible with a range of lighting control software, your gaming setup will outshine the competition.